In this Photoshop text effects tutorial, we're going to see how easy it is to add some visual interest to text in Photoshop by using a copy of the exact same text to shadow itself. First, let's create a new blank Photoshop document. Go up to the File menu at the top of the screen and choose New, or simply use the keyboard shortcut Ctrl+N (Win) / Command+N (Mac). Either method will bring up Photoshop's New Document dialog box. Enter in whatever size you need for your document. I'm going to enter a Width of 6 inches, a Height of 4 inches, and a Resolution of 300 pixels/inch, but again, you can enter whatever size you need. I'm also going to set my Background Contents to White so that white appears as my background color in the document. Click OK when you're done to exit out of the dialog box. Your new blank document will appear on your screen. Select a font and font size in the Options Bar. Then, to select a color for the text, click on the color swatch in the Options Bar. Click on the color swatch in the Options Bar to change the text color. Choose a color for the text from the Color Picker, then click OK to exit out of it. Add your text to the document, then click the checkmark in the Options Bar to accept it. Once you've added your text, your Layers palette will show the text on its own layer directly above the Background layer. The text appears on its own layer above the Background layer. The Layers palette showing a copy of the text layer above the original. Click on the original text layer in the Layers palette. 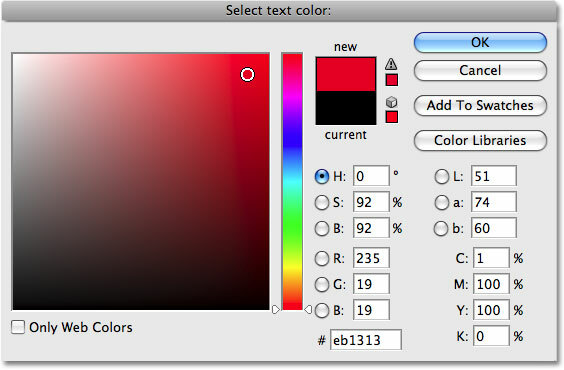 Choose a darker version of the original text color with the Color Picker. When you're done. click OK to exit out of the Color Picker. It won't look like much has happened in your document window just yet because the copied text layer is over top of the original text layer and hiding it from view, but we're going to fix that in the next step. Use the arrow keys to nudge the original text down and to the right to create the shadow effect. Remember, you still need to select the Move Tool first even if you're going to use the arrow keys to move an object. If you want, you can create a second shadow simply by following the same steps. Duplicate the original text layer by pressing Ctrl+J (Win) / Command+J (Mac), then click on the original text layer in the Layers palette to reselect it. Switch back to the Type Tool (since the Move tool is currently selected), click on the color swatch in the Options Bar and select an even darker shade of the color from the Color Picker. Select the Move Tool, then use the arrow keys on the keyboard to nudge the text down and to the right. The effect after adding a second, darker shadow.